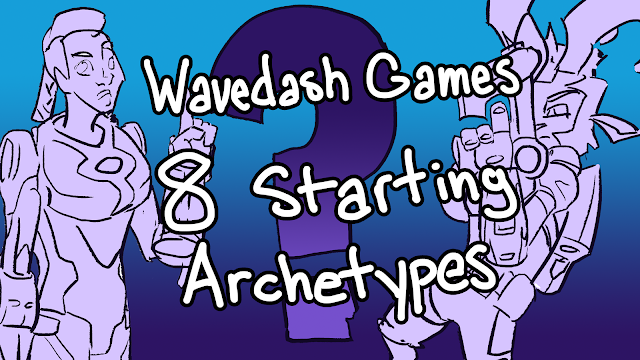 LessThanPi Art: Wavedash Games' 8 starting character archetypes. 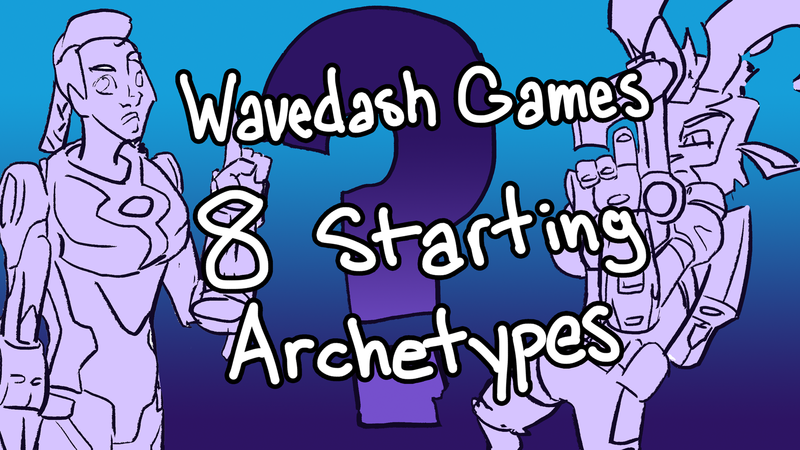 Wavedash Games' 8 starting character archetypes. I like Wavedash games' game and I wanna speculate about it. I mean I can't be the only one interested in this stuff. I'm a HUGE character design nerd, literally that's the only reason I still follow League of Legends. (And in case you didn't catch it some how many of the designers from league are doing work on this project) It is just to look at the new characters they release so that I can drool over that trifecta of art story and game design. So I have to say I'm super excited about what’s to come with the Wavedash project. Now a few weeks back Jason spoke about the 8 main character archetypes he is aiming for upon release I wanted to give my take on them. And be warned reading this I assume you are coming on with a basic understanding of all of the competitive smash games. Read on to check out my thoughts on the list! Ashani is neat. I guessing she is gonna be very Captian Falcon-y, or at least that's the vibe I get. She will be hard to control, but rewarding to master. She will have lack luster/linear recovery but hit like a truck and fly like a jet. I think she is going to take a lot of queues from the smash 4‘s normals and specials that heavily effect momentum. And the team was hinting some type of timer or charge based mechanic for her. Can't wait to see this 70% different they talk about. I think he is going to function very similarly to melee fox but I'm curious about how they are going to handle the shine canceling. Really curious about what his animations will look like. And a bit of a shameless plug here, but if you haven't already check out my Kidd fan art. I hope this dude is like some robot king swordsman or something it'd be pretty cute to pay homage to the King. I think this is a character they are really trying to iron out now; trying find find what the community likes about Marth (and the other swordfighters) and how to translate that play style to their game. I hope the tipper stays around I think that's a great way to reward players for their finesse and spacing and it just looks and feels very nice. What I hope they do is really reward thinking ahead with this character. This is why I'm excited about the game, because they don't have to water down stuff, they can rock out with a battle axe or a spear and not be afraid of scaring parents some how. I think it'd be neat to have a big guy with a weapon like a sword and shield or a lance and shield. I think a slow character that does parries, counters and has heavy super armor would be neat, but unfortunately I don't think we'll find that here though. My guess would be an Axe, Scythe or Bo staff, because of how well they read from a diatance, a spear unfortunately leads a little too much into the tipper identity, so personally I'd like to see a way to go Roy on it and offer that power over the finesse option. I'm thinking like Ganondorf if he had his sword dream here in terms of movement speed and identity. I am not a huge fan of grapplers but its definitely a archetype people like. I'd make something inhuman like a big old toad, a chameleon or an anteater or some type of large long tailed thing so that they could offer variety to the grab animations that read very differently from a far. No eating people though! Tongue is strictly to bring them in closer for Wario/Charizard like bites! I'd make every special a grab. Down special would be a counter that lead to a grab. side special would be a lunging grab with some form of super armor or projectile invulnerability, up special I'd just copy falcon's and for the character’s neutral I would probably do some type shot range bite; like a Wario bite, or a tail whip that reflects that could be used to eat projectiles and help get around/through zoning options since grapplers are always slow. :( but then again maybe Wavedash Games can break that mold here. God knows I love Samus but I don't think she will end up here, in fact I don't really want an arm cannon. (Please, Wavedash games! Please~ don't do an arm cannon!) I imagine a mash up of Jinx from league and Solid Snake (or maybe a more low tech character like good ole link). A character that carries different weapons on them, sets up and plays a zoning game. I think Snake really made watching projectiles fun more so that any other character in smash because there was so much room for out play. Getting through mines and C4s were fun. Grenades has no knock back and were on a set timer so snake didn’t have instant access to stopping linear approaches. Grenades could also be picked up and used against snake which again added to those levels of counter play. The Nikita while controlling a lot of space left snake completely immobile while controlling it. I hope the team uses a model like this one when thinking of a projectile character. I came up with my own concept for a Duo that I think would work in a platform fighter a floaty duo that could control gravity, and used normals to turn the "partner", a floating orb. into a projectile. If you’d like you can check that out here. In reality though I think that my model is really flawed though if I was creating an actual real world game instead of one for use in a comic. Duos are hard to design because of how complex they are, so many situations will come up that you just didn't plan for yet alone code for, things you literally can’t plan for will pop up when thousands of people are playing your game. You know things like infitines and game crashing glitches. I wouldn't have committed to one personally in an opening eigth characters, but I'm very interested in seeing what comes out of this character type. Now are we talking Peach floaty or Jiggly floaty or Wario (yuck...) floaty. Jason said he wants a character that isn't frustrating to play against but these types of characters slow down the game pace so much I'm genuinely curious about how he and the team are going to get to this one. I think you have to slow down their horizontal in order to take out the frustration of having to chase them down. Again I want to see what gameplay choices Jason and the team make to create a character that will fit this mold. I have a lot of faith in the team designing the game and I look forward to seeing how my little predictions match up with or maybe even influence the final choices. And if for any reason at all you are interested in my opinions on the Wavedash project definitely keep an eye on the LessThanPiArt blog because I'll be giving lots of feed back as the game grows and changes. We guys as always God bless, be safe.